You walk out to your car/truck, turn the key, and you hear the glorious click-click noise. Overnight, you’ve had a battery drain, but you didn’t leave the lights on. Who knows where the battery cables are, and you haven’t recharged your jump-box since the last camping trip. Yeah, we’ve all been there. We’ll show you the simple way to find a parasitic battery drain; in other words, we will find what has caused your dead battery. It doesn’t involve parasites in your battery, so that’s a good thing. No need for HazMat suits, yet! A parasitic battery drain is just something that consistently and continually drains your battery. This could be a faulty relay, a headlight/dome-light switch, alternator, or any other electrical gremlins. Taking your car to a mechanic with an “unknown” culprit can cost you big bucks as well. 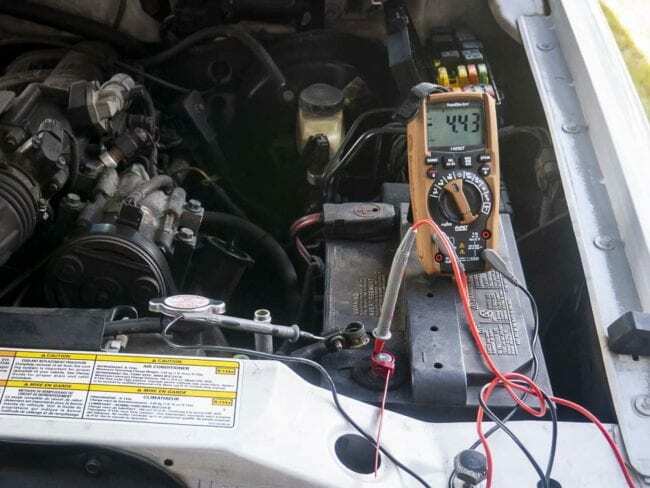 Most mechanics don’t enjoy diagnosing electrical issues. 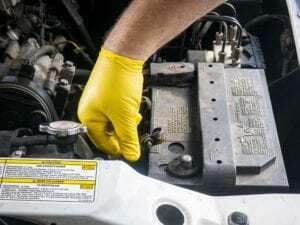 You should be able to diagnose your battery drain issue within a few minutes. An extra helper may help with this project, but it’s not needed. Keep in mind, depending upon your vehicle, you probably have more than one fuse panel. Most vehicles have at least one fuse panel under the hood, and another inside the passenger area. Some foreign cars have multiple fuse panels inside, in different areas. You may want to check your owner’s manual or check one of the forums. 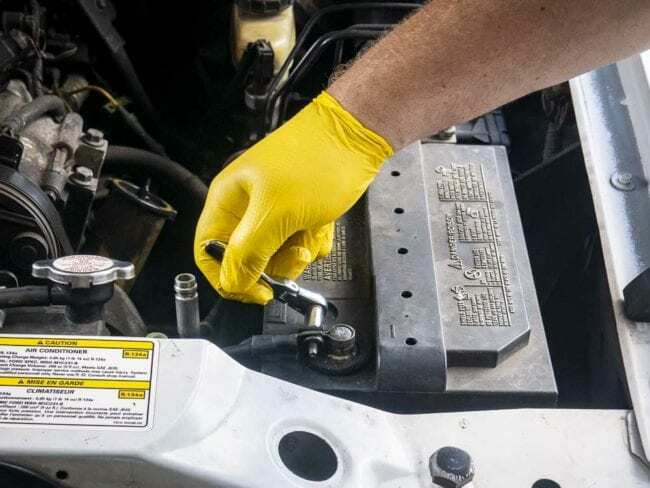 Using the correct wrench or socket, remove the negative battery cable from the battery post. In our case, we were working on a 2000 Ford Explorer, so the battery terminal used an 8mm bolt. You can perform this test/diagnostic by using the positive or negative cable, but using the negative is much safer. Grounding a negative wire to ground is not a problem; however, grounding the positive could destroy electronics, including your multimeter. Turn on your multimeter and select the Amps (A) and make sure it’s set for DC (Direct Current). You should see a symbol like a solid line, with dashes underneath. You Don’t want AC (~), this is for your home’s electric. You will probably have the option for Amps or mA (milliamps), so choose the Amps to start with, preferably 10A or 20A. Make sure your wire leads are in the correct location, on the multimeter. There should be a diagram on the multimeter, showing you where to put the test lead wires. You’re going to be putting your multimeter in series of the battery drain or current draw. This means the current draw will be passing through the multimeter. In our case, we had a 4.4 Amp draw, so that power was flowing through the multimeter. Be certain your leads and dial are in their correct locations. Place one of the wire leads from the multimeter (it doesn’t matter which one) on the negative battery post and the other on the disconnected battery cable. You should see the multimeter display the number of Amps that are actively causing your battery drain. 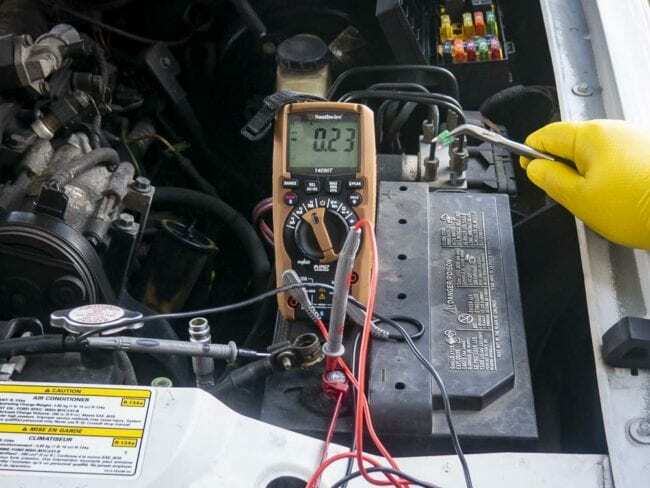 Use zip ties or small clamps to keep the multimeter leads connected to the battery terminal and battery wire. Tip: A normal operating vehicle will have about 50 milliamps of Amp draw on the battery. Start with your underhood fuse panel. 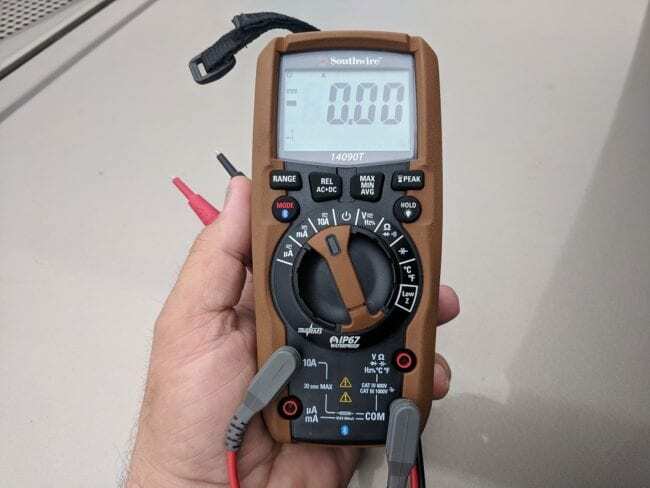 Make sure that you can see your multimeter while you pull fuses. 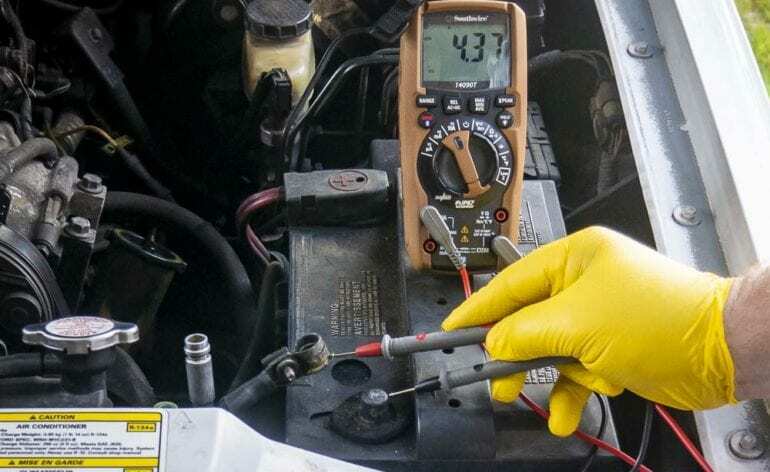 Use your needle-nose pliers or a fuse puller to remove and replace fuses, until you see the Amps on the multimeter drop. Be careful that each fuse goes back into the correct location. 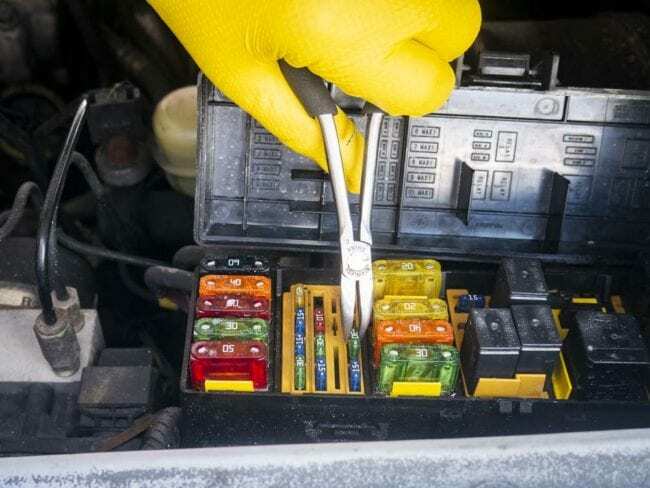 If you get through all your underhood fuses, then move into the inside fuse panels. This is where an extra person can help, they can monitor the multimeter while you pull fuses. 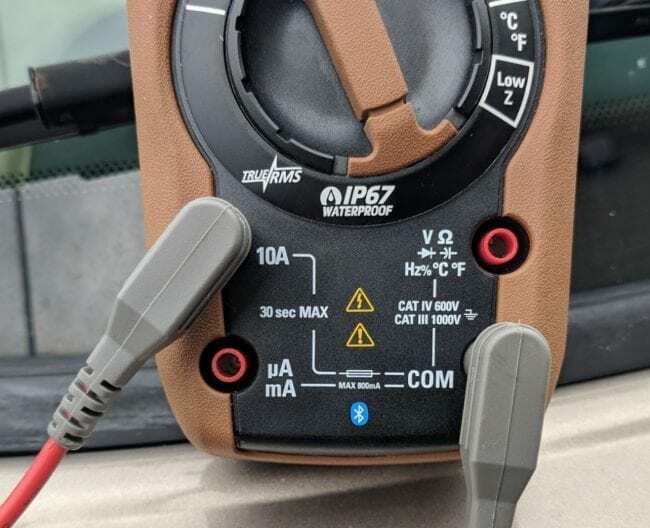 If you don’t have help, the leads on the multimeter should be long enough for you to place the multimeter face-down on the windshield. Once you pull the fuse that is the culprit, then you can fix the issue. In our case, it was the Alternator/Voltage Regulator that was pulling more than 4 Amps continually, which turned out to be a faulty alternator. Once we removed this 30A fuse, the Amp draw dropped to 0.2 Amps, which is still more than typical. We also found a secondary draw with the Interior lamps relay/switch. Removing both fuses dropped our Amp draw down to almost nothing. We replaced our alternator, and we’ll replace the interior switch another time. Now that you have the issue/s fixed, you can remove the zip-ties/clamps from the multimeter leads and replace your negative battery cable. You should be good to go, and your parasitic battery drain has now been fixed. You forgot one very important step. Most cars have multiple modules, (computers), in them now, and some of those modules stay energized for up to 10 minutes when the battery is disconnected. This is especially true for the SDM, (Sensing and Diagnostic Module, aka air bag module). You need to wait for these modules to power down before checking for a parasitic draw, otherwise you may diagnose a faulty module when you remove the fuse for that module only to find out that the replacement module is doing the same thing because you aren’t allowing it to power down.